After coming back from a long walk on a winters day all I want is a hot steaming mug of something yummy, whether that is mulled wine, spices hot apple juice or a rich hot chocolate depends on my mood (and if I am planning on driving later that day!). 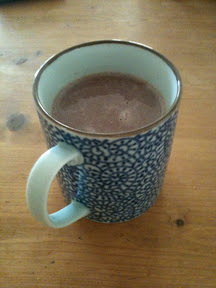 I've been meaning to try this hot chocolate recipe for a while. It's one of Jamie Oliver's that I saw on his Christmas programme. As I've mentioned before I like to try to avoid processed food where possible and although this has some horlicks in it still has less nasties than some shop bought hot chocolate. It also isn't as decedent as it first seems. Don't quote me on it but at a rough calculation a mug made with 250ml skimmed milk contains just under than 200 calories which is far less than a Starbucks tall skinny signature hot chocolate, cheaper and nicer! Start by taking a large jar or tin and place it in 4 heaped tablespoons of good quality sieved cocoa (I used Green and Blacks), 2 heaped tablespoons of horlicks malt powder, 3 heaped tablespoons of sieved icing sugar, 2 heaped tablespoons of sieved cornflour, a pinch of salt, a pinch of cinnamon and 100g of finely grated good quality chocolate (at least 70% cocoa). Put the lid on the jar and shake well to fully combine the ingredients. Place one mug of milk per person in a saucepan and bring to a simmer. Whisk in 4-5 teaspoon of the powder and simmer for a few minutes until it thickens slightly. Serve in mugs topped with a few marshmallows, whipped cream or a cheeky shot of your favourite liqueur if desired. This would also make a lovely present perhaps with a pretty mug, a gift bag full of marshmallows tied with a pretty ribbon or a miniature of liqueur.